I saw a giant wall like a mix between a castle wall and a dam wall all around the country of Wales. And Wales itself was filled with water up to the top of the wall. Walking around on the wall were demons guarding the wall and checking it for leaks, making sure that none of the water got out. Then I saw a hole form into a crack in the wall, and then water began seeping out. The demons guarding on the top of the wall began to go into a panic as the water began running out through the wall, making the hole bigger and bigger at a very fast rate. Then I was up above the continent of Europe looking down on it like a map, and I saw from the nation of Wales a giant wave of water that rushed across the entire continent of Europe like a flood. No more damming up the wells!!! No more damming up the wells. The dam has been broken, the waters have been released, no more stopping up the flow of my anointing upon my people. The fiery axe is at the root and ready to chop off all the dross, all the false shepherds will be scattered and the anointed brought fourth to inherit the land promised to their forefathers and children's children, to the third and fourth generation of those who love me and keep my commandments, to loose the hand of the oppressor that's been damming up the wells of my anointed ones. Break forth my children into song, songs of redemption and joy, hear the battle cry of my people, hear the lion of Judah roar, in the distance listen to it getting near, the sound is reverberating around the nations, it's calling to His chosen, even the lost sheep of Israel. Deep calls to deep and the earth will be scattered of all that are not of Me, and all that hasn't been ordained by Me, time of scattering to now bring in the seeds of the harvest , the ripeness is so tender and so sweet, a freshness and a outpouring above all that you can measure up and count. It will not be by man's hand but by my Spirit says Yahweh!!! The I heard the Lord say as I sat down, THIS IS A KAIROS MOMENT!!!! That means the right, the critical or opportune moment!!! Wales is a hidden treasure that has received an outpouring of the Holy Spirit even though it is the least of the least. My favor is upon you and you will once again shine with My glory as you break forth in Holy Revival. It is ordained by Me and I will do that which I decree and declare. So I speak to My prophets, decree and declare the Welsh revival that I now send. Proclaim it upon the mountain tops, in the cities, and in the byways. For I send forth My Spirit to ignite Holy Flames that will touch and effect the whole earth. Wales is My chosen servant who sings forth My praise and who worships Me in spirit and in truth. So lift up your voices Welshmen, sing the wonders of My name and My great works. Receive the truth and declare righteousness in your land and watch as it flows like a tsunami across your borders and over the waters to other cities, states, nations, and continents. Do not try to emulate or compare this move of the Spirit with any past revivals. This revival is unlike any other in purity, holiness, and power. Miracles and healings, signs and wonders, will become commonplace, not to you viewing them as a common work, but as to frequency they will occur almost constantly. For I do a new work in you, and though My goal is not to astound you, you will be astounded. My goal is not to entertain you but to build you up an army that goes forth doing the works that I did, and greater works than these. It pleases My Father to choose you as one of those sheep nations that will do His will and allow the world to see that He is truly Almighty God and that Satan is minuscule in comparison. I am raising you up as those who went before Jehoshaphat who won the battle for Judah by praising and exalting Me. It is time for true worship to come forth from My church. True worship that terrorizes the enemy and releases My glory in waves of unquenchable and unstoppable majesty. The earth has never seen My majesty like it will in these last days. But this I have chosen before I laid the foundations of the earth. So repent of every sin and the weights that beset you, hinder you, and torment you. Remove your idols from your land. Be the holy people of God I have called you to be and do that which I have called you to do. Awaken Wales. Put off your slumber. Rise up in My love and reveal My goodness to Scotland, Ireland, and England. Awaken, the appointed time has come. Go forth with My invasion army that flows from Scotland into Europe. So rise up and awaken the rest that My love will be revealed to an entire continent and then to the world. Rise up. Your time is now. RISE UP. I see a picture of Wales and below the surface of the land into the earth. It is rich soil but the unusual thing about it is that it contains multitudes of seeds in the earth below. I now see flowers all over and covering the land of Wales beautiful yellow flowers. The Israelites who came out of Egypt were a mixed multitude. They crossed the River Jordan led by Joshua and entered the promised land, a land of milk and honey. They hadn’t personally been there before, but it was their inheritance a land allocated to them by God. The land and the people go together. This was the very same place where Elijah the prophet and Elisha crossed the Jordan river where Elijah was taken up to heaven in the chariot of fire and Elisha picked up his mantle. This was also the very same place that years later John the Baptist was baptizing people in the Jordan river and Jesus asked him to baptize him and He consequently started His ministry from there. God often moves in exactly the same places as before. The same is true of Wales, and as He has done in times past He will do again in the same places, because the seeds of our forefathers are still here in this land. "Oh land, once blest and used so mightily in the past I have not forgotten you and for the sake of your forefathers I am ready to move mightily amongst you once again. I will bless you again - the whole of Wales from the mountains to the valleys including the Islands, every part of it. It’ll spread again to other Nations. It’ll be a mighty move of my Spirit." Many of you have personal seeds in the ground some from ages past and some of latter years – those seeds are still in the ground lying dormant. Visions you’ve seen that you’ve laid down and almost forgotten. They are waiting for the fullness of time. The time is now. Pray – now is the time. 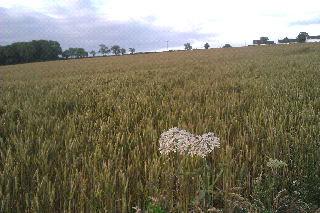 Wales is known as the land of Revival and the land of song – the seeds are still in the ground waiting. Look and ‘see’ this beautiful land full of yellow flowers blossoming, blowing in the wind of my Spirit. – My Spirit is hovering, waiting. Pray to me Oh my people. I will come like the gentle refreshing rain like the former rain and the latter rain – for now. Other Nations are also carrying the seeds of the Welsh Revival from Missionaries that went out from Wales to India, Africa and Korea, Asuza St etc ….. Many are coming back carrying these precious seeds to say "Thank you" and to bless us. In my mind's eye I saw the land of Wales being broken open. It was coming from the coast and it was coming across from west to east, and the land was breaking open. And as I saw this picture, it was like I saw through when Roy said earlier, "this is the year for Wales. And what I saw was a very big angel blowing like a trumpet. He was blowing a small ram’s horn with sharp blasts, with short blasts. And also what happened is I saw this word, the word was "intercession". And what I felt was simply that God was saying, that there is an imminent move of God going to break out in Wales. It was just so real that God is going to release something this year, but He needs intercession. I don't know what intercession is, I used to think I knew what intercession meant, like I used know what I thought revival was. Actually I don't know, but the word is revival in Wales. I believe it is connected to the land, and there is the song that’s being released. But God is requiring people in intercession. And I know that there are people here who have been brought here to Wales. We know some people... But it's like now is the time. And when Roy shared that this morning I just thought, "Wow, wow, wow!" It's so exciting. God is going to do something! Tuesday this week has been quite remarkable. The Spirit spoke to me on a number of occasions. I had to go to a little Welsh Village called Pontardawe to drop off a new tablet with one of my customers. Since the Black Mountains were only 10 mins away from the customer, I had already decided to go there afterwards to pray. On the way to my customer, the Spirit gave me a vision. As I was driving I could see a huge white blanket up in the sky, as far as I was able to see. It went beyond the horizon. This white blanket started to slowly descend towards the ground until it reached the level of my head. As soon as it touched people going about their daily business, their normal clothes were replaced by robes whiter than snow. Everyone whom the blanket descended upon was changed like this until all that I could see were in white. I knew the Spirit was speaking to me about another visitation to the land. I heard Him speak, saying "The blanket is called 'Righteousness' and I will yet again cover this whole land with Righteousness!" I continued to make my way to the customer's home. Just before I left the customer, I explained what my plan was regarding going to the Black Mountains so they could tell me the best way to get there, and where to park once I had arrived. As I was about to leave, the customer said "Wait there!" and wandered off into the kitchen. He came back with a bottle of water for me straight from the fridge, saying "You better take this, you will need it!". I thanked him, quietly thanking God for His provision in my mind. On the way I couldn't help noticing about 7 chapels, most of which were derelict and had been boarded up as the windows were broken and unsafe. I stopped and took a few photos of them, noticing as I did so that the dates seemed to be around 1904-1905 or just before. I knew that these buildings were erected as a result of the previous revival in 1904. My heart sank and I had a lump in my throat. It is so sad. "Yes!... And You started to climb this mountain because you knew you could reach the top. Your prayer life is like this mountain! You were not able to see the top yet you still knew it was there waiting for you! As you started to climb, you got tired. The higher you climbed, the more tired you got, to the point that you had to stop for a rest. But you continued! As you reached near the top, you could feel the wind blowing against you. You still could not see the top. But you knew it was reachable. You fought with the wind as I directed your path towards that first stone. You did not turn left or right but persevered towards it as you knew it was reachable. I did not show you the destination as if you had seen it so early, you would have given up. I am your stone. Make Me your focus! Push towards ME! One step(ping stone) at a time! When you pray, you are going against every grain of the flesh. It is like the wind. Don't give up! The higher you go, the harder it will be. But you will eventually reach your goal, and when you do, the view of My creation will astonish you! This message is for you, and for My people!" I instantly wanted to fall to the ground and weep there and then. I stayed up there for a while, praying over the valleys that He was showing me, praying over the lives of those who lived in them, asking Him to quicken His visit and touch the people of this land. Those that can hear, please weigh this up with God’s word and listen to what the Spirit is saying! I say to you I am bringing a new quickening of power across Wales. Get ready, for a quickening power, that will cause the birth of heaven to come down into the atmosphere of this nation, is now being released. I say to you even the next 6 months, that which I have conceived in the last 3 will now begin to open up and mature. I say to you this is your quickening time and during the day and especially through the night, My people throughout this land will be crying day and night for Me to come. And I say to you get ready, for I will surprise you at the gates of this nation. Now as we worship let the bowls fill up and be poured out. I decree right now there’s a filling going on in heaven, so a pouring out can occur, in this nation. You have said do it again Lord, but I say a generation is arising that are hungry after Me. A generation that will go beyond the stories that they’ve heard in the past, and the history of a land where heaven and earth have kissed. And I say this generation which you’re a part of; even some of you who are 80 plus, I say three generations will now arise in this land and see Me move in a new way. I say to you, I want to begin new and fresh. Even though I have come before, I say it is not that crossing over for this season, but I, instead of doing again, will now begin. For I say an angelic host have been waiting, and many have come, but now they stand positioned in the land, ready to say who will go with Me into this season ahead. I say many houses have gone awry. And many families have gone astray during this season of wandering in this land. But I say I have come to repair the door of the house of My people in this land of Wales. And I say, if you will allow me to repair the door of your house, you will come out and help Me repair the door of My house, and then you will build an altar new and fresh in this land. I say, it is that altar that I am calling for in this hour, so that My incense and fragrance, that is dwelling in this land, will arise and be smelled by Me, and be filled, and what wasn’t coming into fullness in one season, I will pour out in fullness in another season. I say to you I am very near to you. I am nearer to you now than you have known. I say the very ground you have been walking on has been crying out, saying, we long to have the glory come, and to be used again to build a new altar in this land. And I say I have heard the cry of the land, and now a people are responding, and saying we are ready to build. And the Lord says to you, I have been waiting for you to pour yourself out to Me again. It is you I’ve been waiting and watching for. And I say now, I see a people in this land who say we are ready not to hold back any longer, but to pour out again, and give You the best of this land. I saw, 6 months ahead, where there were sealed doors in the heavenly realm. 6 doors. Man had sealed these doors up. All of a sudden, I could see those 6 doors, I could see why they had been sealed for 100 years. And I actually could see, it was like a 100 year war that had gone on in the heavenlies below. And God had sealed the door because of the warfare that had been above this land. But all of a sudden, when we hit that song, one of the doors, the seal had started to melt on it, I could see it. And as we hit that song, that door started coming open. And I could see behind the door. Now, the Lord says to you, the next 6 months for this land is key. The next 6 months your worship is key. And I think you should worship the way you're accustomed to worshipping, in places like this wonderful place we're in. But I also think you should find strategic times to just come together in worship. Where you come here and you begin to worship, and you worship until you feel the Spirit of God is satisfied. And the moment you finish, that door is going to start coming open, and what got sealed up a 100 years ago will now be opened and the prophetic anointing will start stirring over this land and you will speak a thing and that warfare that's been in the heavenlies over this land will not be able to stand in resistance against the Word that God's going to bring down to activate the next move. A tsunami of God's presence is racing toward the shores of your nation. Tremors and quakes in the Spirit are creating wave after wave to crash against the strongholds of those that oppress you. The intercession that you are offering up is weakening the base of these structures. God will come i like a flood and destroy the throe of the "imposter" that has enthroned himself. He is beginning to awaken hearts and minds to the reality of the Spirit and the importance He will play to the total victory of these battles. Our King is sending assignments and royal decrees all across the world to your brothers and sisters. They will begin actively engaging in warfare and intercession with you until you see victory. He is activating a new "breed" of people. A people dedicated to the Master and His Holy Kingdom. They will move as one body. They will not defile themselves with the ungodliness that the world has embraced. They hang on every word from the Master's mouth, eagerly awaiting their next assignment. They do not fear the ancient ones that have enshrined themselves in our governments, our schools, our homes, and our churches. He is activating a people to come against an entire religious system that has lasted nearly since the foundation of the Earth. They have been assigned to see the demise of Babylon and all the demonic strongholds she has built. Do not fear. The Lord is watching and He has taken account of all those that have come against you. Remain strong and steadfast in the face of the enemy. Do not turn and run. Stand and resist and he must flee. But more importantly, SUBMIT yourself to the King for your victory is nigh. Praise be to our King and Lord. It is by His mouth that kingdoms rise and fall. ALL GOVERNMENT rests on His shoulders. We are standing with you, my brothers and sisters. Amen. A significant prophetic word was released by Dr. Willie Soans at the Powys Prayer Conference in early September of this year. He had kept the word for a year prior to God allowing him to release it in Wales. The reference comes from Acts3:1-8. Peter and John went to pray at the 9th. hour - the hour of prayer. The hour of prayer has come to this nation. God has now opened a window over this nation which is called the hour of prayer. You have come into a place prophetically when God is going to hear your prayer. It is a prophetic window that has opened and it is the hour, it is the time, it is the season. If you walk in obedience God will hear your cry and do mighty things. This is the hour of prayer, I will hear you and make the lame walk. 9th. hour is hour of miracles. 9th. hour opens our eyes to the things God wants us to see. There are many people at the gate. You must bring them from lameness to life. I looked up and saw a huge set of scales spanning miles over the countryside, which was parched and dry, the ground cracked in places. On one end of the scales was a giant bucket labelled 'Spirit'. On the other end was another bucket labelled 'Flesh'. The Lord showed me that there was a large hole in the bucked labelled 'Flesh'. All of a sudden it started to rain. The bucket labelled 'Spirit' started to fill up and as it did so, the scales began to drop on one side with the weight of the water. As the rains continued, the other end of the scales started to rise and continued to do so until finally touching Heaven. At this point I saw immense floodgates open, followed by a loud rush of water. Then great waterfalls of water fell onto the ground. The cracks disappeared and in their place, great shoots started to push up through the ground forming green fields of lush grass as far as the human eye can see. I then saw multitudes of sheep grazing on the grass until their bellies were full, to the point were they were laying down and resting in contentment. The Lord showed me that the set of scales is us and the sheep is the lost. God will bring justice to His people through us... but we should not try and repair the hole in the bucket labelled 'Flesh' (Not by might, nor by power, but by My Spirit saith the Lord!) because it will always be there. We need to go back to basics, back to the old fashioned altar on our knees and pray for the rain in our own lives and walk in the Spirit so that this 'bucket' gets filled. The rest, God will take care of. WALES is a place of great safety, a welcoming home for many in the place. It is a sending and receiving base. demonic even though they are not walking with God themselves! I will reveal myself to them in ways you have never seen before. a 'today' nation, and we need to call Wales into (her) its destiny. Whatever is in the ancient past is not holding this place back. in this place (and then the lord said parent and toddler groups). another group of people that are only partially persuaded. this nation to go to the root. that brought about a people who are unsure, not willing and undecided. God's anointing will hit you. people willing to go to war - to be willing to take the kingdom. the centre of the wheel must be supported underneath by intercession. reputation, expectations, agendas and ambitions. At place of 24/7 praise & worship, about 10:10am, a couple I had never seen before, sat beside me. I welcomed the woman & asked where they were from & she said, "The U. K.." I instantly saw a vision of the UK in the cupped hands of the Lord God of Israel. He was smiling with such a look of tender love at the UK in his cupped hands. As I my eyes were focused on the UK. I saw fires springing up in Wales & going up north to Scotland & all down the eastern border & down south into England & back up to Wales--even Northern Ireland was bordered with flames of fire. The fires burning all around the borders of the UK then moved into the center & became a huge pillar of fire that then began to send long arms to all the countries north, east, south, & across the Atlantic to the west. I KNEW what I was seeing and told the lady, "God has not forgotten the UK, for His fires of revival are going to spring up once again, mightier than before & once again she is going to be sending her people all over the world with the truth of Jesus, like she did in her past. This is the word of the Lord from Jerusalem, & you can COUNT on it, for it WILL come to pass!!!" Two things struck me tonight. The first thing was the daffodil. I used to sell flowers, so I learned a little bit during those years selling flowers. The daffodil is known as the trumpet. It has something to do with Wales, and St. Davids. It is the trumpet. And I just heard the Lord saying to me, "This nation is going to be the trumpet. This nation is going to be the trumpet to awaken the U.K."
In the bible they used the trumpet to tell them when to move camp. They used the trumpet to gather the people for war. And I really believe this is a significant, very significant symbol. It's the first…, well…, it's the trumpet ... the trumpet. Let Wales be the trumpet! Let Wales be the trumpet. Let the sound, let the awakening, let the great awakening start from this nation, and overflow to England, to Scotland, to Ireland. And across the channel, across the channel, across the channel, across the channel to mainland Europe, and to my German friends. Oh, God bless you! This is a vision I had at a New Wine Conference. Here is a short version.. I had a real zap of the Holy Spirit. My arm shot up as like a Beacon torch and fire ran down my spine... my feet started to march... and I had an open vision. 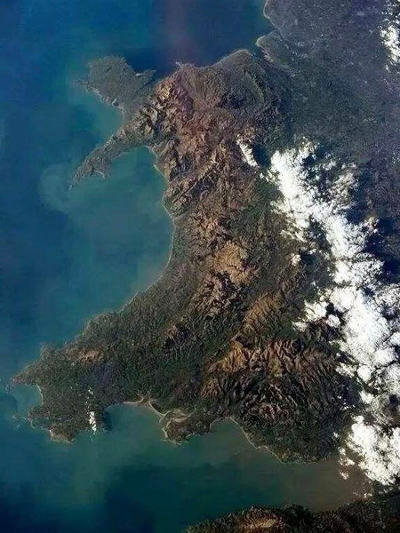 I saw an aerial view of the outline of the bottom coastline of wales... around the Cardiff area and the larger surrounding area. This then panned out into a beautiful rural area inland, roughly above Cardiff in the Breacon Beacons. I could see hundreds of YOUTH all spaced out on the grassy mountain side by side in a line, with arms raised up and their arms were like torches alight (I believe this was prayer and the word of God that was rooted in them). Then before them I saw the same number of youth that had drums and were beating them in unison. They marched before them to prepare the land (the worshipers break down the spiritual resistance of the land and scare off the demons, cleansing the land) in the direction inland (or north if that helps). “Land of valley and song, I say to you again prepare, prepare for a visitation of My Spirit. I have not forgotten or overlooked you. Once again the breath of God will be felt as My Spirit bloweth through you; a mighty wind, a powerful wind, a wind of change that will blow the shame from your towns and city centres. This word was given during the singing of "I Hear Thy Welcome Voice" in Welsh, "Mi Glywaf Dyner Lais." "The Heart of Wales is not an area of land in Mid Wales. lt is the Welsh-speaking community. The Welsh-speaking community is the Heart of Wales, and it holds a special place within My heart. "Return to Me, Heart of Wales, l have not finished with you. l love you. l have plans for you. How l love you, Heart of Wales. How l desire your worship. How l long to receive your prayers and commune with you once more. Turn to Me and live. "Hear, land of Wales; pray for the Heart. Be reconciled with the Heart. Cry out to Me for the Heart. "As the Heart returns to Me I will release blessings upon the whole nation. "But seek Me first, not my blessings." ln hell, alarm bells went off and there was pandemonium. "This song is anointed as a vehicle of return for the Welsh community." I saw a bird, a brown/grey dove, very attractive, circling high in the sky - it represented the move of God in Wales. Then in its chest, there appeared to be a weight, a heaviness, and the weight began to bring it down... it came down and down and finally it touched the earth. I saw it scrape the earth with its chest and in the dream I thought it was surely going to die. All of a sudden the weight seemed to fall off and it slowly began to rise again, circling up and up. I woke up singing an old song "I will put on the garment of praise; I will put on the garment of praise; the spirit of heaviness is gone from me. I will put on the garment of praise." "Wales - I will restore the song of the Spirit and the Joy of the Lord. You have prayed and wept and now is the time to praise and dance, for praise will make you lighter and lighter and you will shake off the ashes and the spirit of mourning - the song will be released from Wales and cover the whole earth again (don't try and do it though - it will happen) and your fine preachers will once again be known for their eloquence, but the eloquence will be of the Spirit and will bring release and not condemnation - do not take the religious spirit back - keep it out. Close down the mines of stale religion and open up the gates of praise." God is going to restore to Wales the Seer anointing which Evan Roberts operated in. Basically with the seer type anointing the Holy Spirit moves on your senses a great deal - touch, taste, sight, hearing smell etc. .. I saw the nation of Wales and a tiny chapel become illumined in the Glory of God. Indeed I saw the land in Wales broken up and the ground prepared for this mighty ouptouring. Tiny tiny Wales, mighty mighty God. "This day says the Lord, I am sending the Song of Revival into the hearts of this tiny nation, and I will use the broken and the humble vessels. I have sent to you little Wales, Elijah and Gideon, I have sent to you Deborah. I will appropriate the past mantles of the prophets on you tiny nation and you shall march out carrying the Banner of My Glory says the Lord. I am sending you out little Gideon. Where I have visited before I shall visit again and you shall not be able to measure this outpouring of My Glory. There will be no misappropriation of the anointing, for those who will carry this Glory will be purified as gold, My humble servants. Those who would seek to misappropriate My Glory will be removed from this revival as they are unable to be used by Me. And see the Day of Lament has passed and the Song of the Lord shall rise from this land once more. I have sent Deborah to wage a mighty war in my name, and I am releasing women and the children to go forth in the Glory and they shall slay the Barak's as the tent pegs are stretched, as My Glory comes down, as your cords and stakes are moved beyond the boundaries man has set, your greatest expectation I shall exceed. I will overcome you in Love and you will seek in reverential fear to hide from My beauty and My Majesty, but see in tenderness I will draw you out. Fear not the mighty anointing, fear not, for I will fill only those vessels who are willing to pay the price; who are willing to share in My sacrifice; who are willing to be hidden completely in Me, who will give Me all the glory and will not even seek one portion for their flesh. Upon these hidden ones I shall confer a double portion as Elisha received. TODAY I AM UNCAPPING ANCIENT WELLS! I will visit many places My Spirit has gone before, indeed I will visit where I purpose and My Spirit shall go where He is welcomed and unconstrained, but for today I am uncapping the ancient wells. Wells that you have cried to me in desperation would be opened, yet you knew not how. So I have sent you Elijah and I have sent you Gideon and Deborah, and they shall be my chosen vessels to open up the wells. They are not the revival but they will be used of Me to usher in the Glory. I am come with My Grace to this land, rise up Men of God and valiant be, rise up Men of God who are hidden in Me, rise up sons of Thunder and raise a mighty shout, rise up beloved ones and carry My Glory out. The Person of My Spirit is come. My Kingdom is come. Prophesy to the four corners of the earth, for the visitation of My Glory is come. Tiny Wales-- you who are broken, you who are humbled--See, your Father lifts you up and exalts you before all men and all nations. I shall send forth the revival flames once more from your shores. Expect new things, but see me also in tradition. I am come. I am come. I am come, I am the Ancient of Days." Oh Father bless precious Wales. Bless precious Wales. Send your Spirit for the sake of Christ. Send your Spirit for the sake of Christ. Send your Spirit for the sake of Christ. Amen. Evan Roberts on 3 November 1904 met at Moriah with a number of chldren to pray "Send the Holy Spirit to Moriah for Jesus' sake." He spoke on that evening on, "Ask, and it shall be given you." "These things must be believed", he said, "if the work is to succeed. We must believe in a conquering Christ who is able to defeat all opposition." Evan was compelled to press the point with more boldness than he had ever felt before." (extract taken from "The World Aflame" Rick Joyner). These words I believe hold the key to the prophetic revelation. Evan Roberts understood that WE MUST BELIEVE IN A CONQUERING CHRIST WHO IS ABLE TO DEFEAT ALL OPPOSITION. Without that knowledge he knew there would be no sustained revival, for man's eyes would not be fixed on Christ and His victory won for us, but rather on the things of the flesh, and/or opposition from the enemy. Barak almost made a grave mistake. When he first heard the Lord's instruction to go and fight the enemy commander and his army, his initial response was not faith but fear and denial of the power of God. Through Deborah the Lord was instructing Barak to go and take on the 10,000 men of Naphtali and Zebulun and to lead the way to Mount Tabor. BARAK TO DEBORAH --"I'LL ONLY GO IF YOU GO WITH ME"
Barak was not prepared to enter the battle trusting God. He replied to Deborah "If you go with me, I will go; but if you don't go with me, I won't go." Judges 4:8 The spirit within Barak did not believe in a conquering God who was able to defeat all opposition. Barak placed more belief in Deborah by his side than in the Lord God of Hosts as his strong deliverer. He had no revelation of the battle belonging to God, nor of the power that was in him being greater than the power in this world. Further, Barak was concerned for his flesh. The Lord is bringing together an end time army who will "love not their own lives unto death". This is the revelation within the prophetic word for revival in Wales that we must understand. Without our eyes firmly fixed on Jesus as the risen victorious Christ, we will not be able to be used in the Lord's army against his enemy's. The fear of man must be slain, lack of faith/disbelief must be slain and the greater glory of God must become our ultimate goal if "the work [revival] is to succeed". We will surely perish without this foundation in Christ. The end time army will be a fearless, anointed army with no trace of the 'spirit' and rights to self within Barak. To be anything less that completely focused on the Lord and His awesome power will mean we are in danger of missing the commission set before us. It must be in His strength alone and completely dependent on Him that we move forward into revival. There are 'giants' that must be slain and it is only hidden in Christ and abandoned to His precious Spirit that we may be used to re-enforce the victory of Calvary. Within God's Holy Word we come to understand how the enemy commander Sisera was killed by Jael - we are shown the defeat of the 'enemy without'. The Lord in His loving mercy is giving us a further 'key' - in studying Barak's responses and actions we are given some insight into the 'enemy within' - our sinful concern for our flesh, and our carnal doubts and lack of faith and belief in the nature and character of God as the Lord of Hosts. I therefore believe we must repent of the sins that Barak walked in and ask the Lord for forgiveness. The Spirit will bring this conviction and through the Deborah anointing He will release those with a similar spirit to Barak. The end time army must march out in faith having sought the Lord with all of their heart, for there is no time for half hearted commitment or poorly shod armour or any amount of self-reliance. The warfare will intensify and we must be prepared in Him, willing to lay down our lives at any cost to see His Kingdom established in all the earth, and millions of souls won for Jesus. "Father, I thank you for this lesson in humility and for your Mercy to your children. I thank you personally for showing me new depths of reliance on you and ask that only what is of you remain. Forgive me Lord, should there be any error in the Word I have delivered, and my heart's cry remains, 'Lord, don't let me harm the Body', my greatest desire is to do your will. Father, show us by your Spirit where we continue in our carnal ways, when you would have us abandon these rights to self before your cross. Lead us in repentance, teach us how to yield to your precious Spirit, cleanse and purify us and anoint us with power from on high for your greater glory. In Jesus name, Amen"
It was May of 1999 that I was flying from Indianapolis to London, on my way to Sri Lanka then to stop in Wales on the way back. Before landing at Heathrow I had been praying about my trip and the ministry I had in mind to accomplish. I had just read an account of the 1904 Welsh revival and was greatly inspired. Two weeks prior to my flight one of my intercessors shared a word with me saying the Lord was going to open my eyes to things I had never seen. She said the Lord was going to allow me to see things from his vantage point. Near the end of my flight I was looking out the window the window and saw in the Spirit what I am sure I could not see with my physical eyes. I saw the outline of a country which I immediately recognized as Wales. At first I did not understand what I was seeing because the country seemed to be convulsing as though a mighty earthquake was shaking it. The best I can describe the sight was the countrysides were undulating, writhing almost as in great pain. I thought these were birth pangs but couldn't be positive. After what seemed to be twenty or thirty minutes (probably more like 2 minutes) all I could see were the clouds between the plane and the ground. However, the Lord spoke that what I had seen was the warfare going on 'underground', unseen by all except those with eyes to see, but He reminded me that the Kingdom of God was going to break in again upon Wales not just with a visitation of revival, but with a spiritual transformation that would be sustained for several generations. I did identify 'pockets of activity' all over the country which I interpreted as spiritual warfare going on by individuals or small groups of people who were not connected together. Rather, it seemed to me the Lord had sovereignly raised them up to intercede. He was conducting a symphony of prayer for which no man could claim credit. My heart was greatly encouraged.